Four outstanding New Mexico women writers will be honored for their work in fiction on Saturday, April 27, 2019 at 12:15-1:35 p.m. at the Canyon Club at Four Hills, in Albuquerque. When a Woman Rises, by Christine Eber. An overall winner will be announced at the event, with the other finalists receiving Honorable Mention awards. 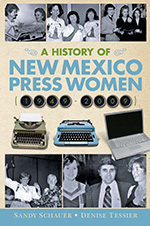 The awards will be presented during the 2019 New Mexico Press Women’s Annual Convention. Anyone interested in attending the convention or the awards luncheon can get more information on the NMPW 2019 convention page.